Check out my video to see how sweet I am. Orreo started life as a shy kitten and has evolved into a somewhat shy, but quiet little lady. She prefers quiet and slow introductions, sweet, soft word and gentle pets and chin rubs. From there, the magical purr begins to hum. Orreo loves the company of other cats so she would be an ideal companion. 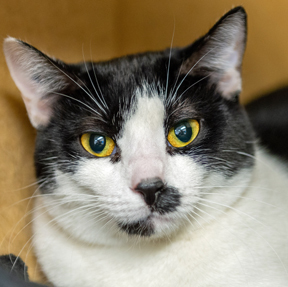 If you are looking for two cats, Orreo's sister, Lil Mittens, would be a purrfect friend.